Life in the early days was not all toil or warfare. There was much rude comfort, hospitality and good living, and the pioneers had their times of gaiety and diversion. Frequently, work and merry-making were combined. Logging bees, barn-raisings, corn-husking and apple-paring parties brought together all the settlers from a circuit of many miles. Most localities could! supply a fiddler, or in the Scotch settlements, a piper, and these community labours generally ended with a dance. The picture shows the costumes of the period from about 1830 to 1850, as worn at a somewhat formal dance, when all put on their best clothes. In select British circles, it was for the men largely a clean-shaven era. At most a "muttonchop" side whisker, descending no lower than the bottom of the ear, was permissible. Only cavalry soldiers wore moustaches: no one except foreigners, very old men, or some Highlanders or backwoodsmen, wore beards. There were signs of an approaching change of fashion to be seen on some faces; but the golden age of whiskers did not come in till the sixties, when individual taste cut all sorts of fantastic patterns, from full beards to fringes round the jaws, goatees, Donegals and Dundrearys. Men's hair was worn longer than at present, and was combed forward over the ears. Their shirt collars came high up on the cheeks, and were confined by stiff stocks, or by neck-cloths tied in a wide bow. Their waistcoats were often double-breasted, cut low to show a frilled shirtfront, and gay -- not to say glaring -- with bright colours in plaid patterns or flower spray designs. Coats were of every colour; brown, blue, green or maroon; with high collars, often of velvet, wide, deep lapels, and bright brass or silver buttons. The cuffs of the sleeves came well down on the hands, and were split at the back, with a row of buttons which could be unfastened and the cuffs tucked out of the way if necessary. These buttons are still retained on the men's coats of to-day, though they no longer serve their original purpose. Trousers were of corduroy cloth, homespun, or moleskin, strapped under square-toed shoes, or tucked into top-boots. The women wore tight-fitting bodices, terminating in a sharp, deep point in front, with elbow-length balloon sleeves, and a lace frill falling over the forearm. 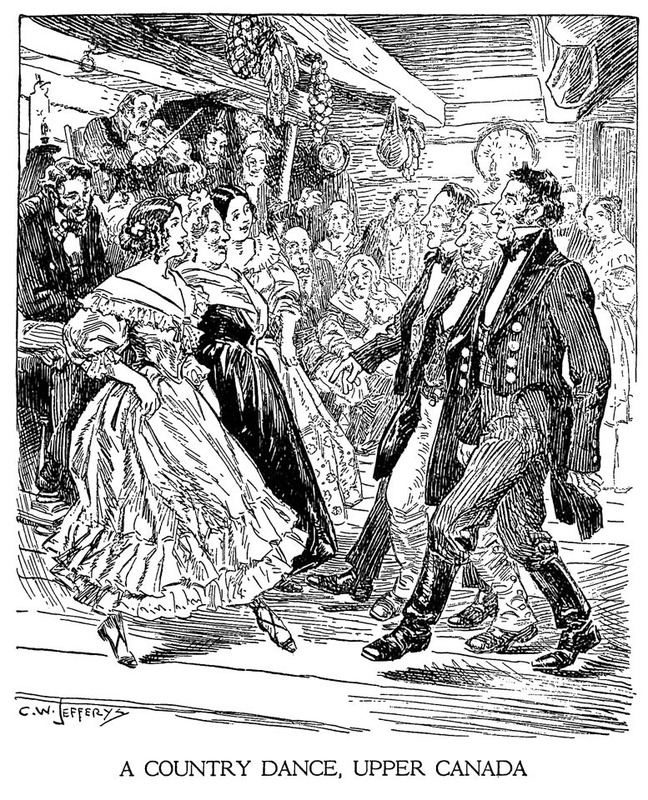 Skirts were wide and ankle deep, gathered at the slim waist, which then was every woman's desire, and fashioned with flounces, frills and tucks. A white kerchief or fall of lace was draped over the shoulders and bust, and fastened in front with a brooch, a bow or a sprig of flowers. The slippers were low-heeled, with straps or wide laces cross gartered over the instep and around the ankle. The hair was parted smoothly in the centre, and drawn tightly over the ears and tied in a knot at the back of the head, while long ringlets or short curls fell on either side of the face. Some of the elder women wore caps or turbans. The house shown in the drawing is built of logs, square and smoothed with the adze or broad axe. Candles in sconces with bright tin reflectors behind them are fastened to the walls. From the beams hang ears of corn, hams and strings of onions. A rude stairway leads to a trap door opening on the low half-story or attic above. Skelton, Isabel. 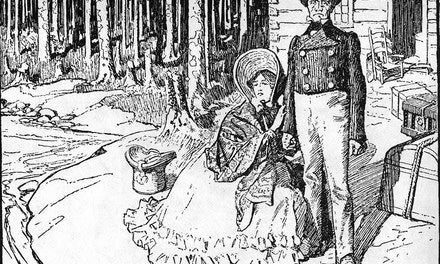 The backwoodswoman: a chronicle of pioneer home life in Upper and Lower Canada. Toronto, Ryerson, 1924. 261 p. Illus. Paterson, Gilbert. Canada From the Earliest Times to the Present. (Toronto: Ryerson Press, 1933). 233 p. Illus. Henry, Lorne J. and Paterson, Gilbert. Pioneer days in Ontario. (Toronto: Ryerson Press, 1938). 234 p. Illus. Thomson, A.D. The Story of the Americas. (Toronto: Ryerson Press, 1942). 171 p. Illus. Deacon, William Arthur. “Senior Canadian artist finishes picture history.” In The Globe and Mail, Dec. 30, 1950, p. 17. Illus. ibid. “A Heritage for Canadians.” In Imperial Oil Review, Sept. 1952, p. 2-7. "The Golden Lion: His Own Tale." In York Pioneer, 1960, p. 52-56. Illus. Imperial Oil Limited. “C.W. Jefferys – from the Imperial Oil Collection.” In Canadian Art, #68, v. 17, no. 2, Mar. 1960, p. 56. Illus. Graham, M. Audrey. 150 years at St. John’s York Mills. Toronto, General Pub., 1966. 275 p. Illus. Mika, Nick and Helma. United Empire Loyalists: Pioneers of Upper Canada. Belleville, Mika Pub. Co., 1976. 256 p. Illus. Murphy, Larry. Thomas Keefer. Toronto, Fitzhenry and Whiteside, 1977, 64 p. Illus. Walker, Paul. C.W. Jefferys and Images of Canadian Identity in School Textbooks. (Kingston, Ont. : Queen’s University, 1990). Masters of Art thesis. 130 p. Illus. Jamison, Phil. Hoedowns, Reels, and Frolics: Roots and Branches of Southern Appalachian Dance. University of Illinois Press, July 2015. 304 p. illus.